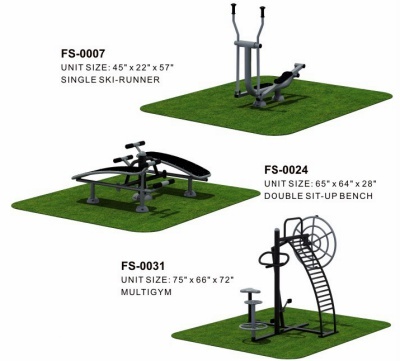 Our Fitness series is the best way to enhance your outdoor fitness trail or area. Q-Fitness™ allows for one or two people to use a piece of equipment at the same time. There is a wide variety of options for enhancing your normal routine for stretching and cardio training. Any of our fitness packages give you the ability to isolate upper or lower body development, as well as abdominal/core development. Designed to meet health needs and promote active living amongst teens, adults and seniors in your community, this equipment provides opportunities for users to prolong their active life by increasing mobility and flexibility. It goes beyond making a community physically healthy; it's actually building community ties together. We have installed outdoor fitness equipment for the Towns of Athabasca, Barnwell, Blackfalds, Blackie, Brooks, several in Calgary and Edmonton, Drayton Valley, Edson, Evansburg, Glennifer Lake, Grande Prairie, several in Hanna, High River, Lanley, and New Norway in Alberta; the Towns of Balgonie and Meadow Lake in Saskatchewan; Carmen and Notre Dame De Lourdes in Manitoba; Fort Francis in Ontario; and a couple in Barriere, British Columbia. To create a fun social fitness environment for your community, check out our current catalogue, call us Toll Free at 1-800-663-6711 (Local: 403-556-7300).